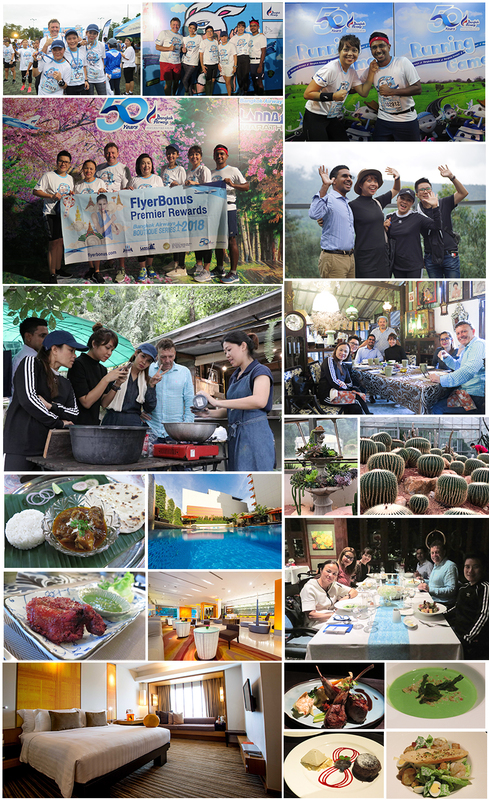 FlyerBonus, the Frequent Flyer Programme of Bangkok Airways', recently organised an exclusive trip for Premier Members and their companions to participate in the "Bangkok Airways Boutique Series Lanna Marathon 2018" held between 10-11 November. As well as undertake a grueling marathon, the group also had time to visit "Queen Sirikit Botanic Garden", enjoy delicious dishes at popular restaurants and have a pleasant stay at "dusitD2 Chiang Mai". Check-in and freshen up at "dusitD2 Chiang Mai Hotel", surrounded by the city's bustling night bazaar, restaurants and entertainment. The casual atmosphere throughout this boutique hotel extends from the classical Thai of "Cafe SOI" restaurant to the laid-back attitudes at "Mix Bar" and poolside. For those looking to wind down, "Devarana Spa" is the hotel's multi-award-winning spa, while those looking to wind up can do so at "DFit", one of the best-equipped health clubs in Chiang Mai. For tonight's dinner at "137 Pillars House". Savour the epicurean art of gourmet cuisine in a beautiful colonial house dating back 130 years and Head back to the dusitD2 Chiang Mai Hotel for the evening.